If I were to say there's a CSS 3 feature that all major browsers support except one, which browser would you guess is lacking? The answer for today is Mozilla Firefox. It has come up several times on my current project where we've needed to take a variable amount of information and stuff it into a limited space, where aesthetics demand we truncate the data instead of allowing an overflow or a word wrap. The typical way to do this is with an ellipsis, but at what point one should truncate the message is usually the result of guesswork. Checking to see if a string is over, say, 35 characters and cutting it off if it is may work in most cases; but because in a proportional font, the same number of characters can be different sizes depending on which actual characters are used, any fixed number will result in some data elements appearing too short, and a few appearing too long and wrapping or overflowing anyway. Enter the text-overflow style. In a fixed div or span, setting style="text-overflow: ellipsis;" will cause the browser to truncate the contents with an ellipsis if, when, and where it is needed. Except for Firefox. Since CSS 3 is still technically in "draft", the coders behind Firefox have decided not to implement text-overflow, despite it being on the bug list since 2005. Mozilla's own developer forum shows that Firefox is the only browser to not implement this to date. Oddly enough, this is the second time Firefox has failed me recently (the first being a misbehaving feature that plays havoc with AJAX queries). I found two solutions on the web. One is to use something called XUL binding. The procedure (described here) involves creating an XML document that describes the requested behavior, and then using a Mozilla-specific CSS directive to bind it to the element. Unfortunately, not only does this require another document, but it may conflict with the text-overflow style such that only one or the other will work, but not both. Also, following the comments in the bug, XUL appears to be going away with Firefox 4, and with text-overflow still not implemented, this workaround will work no longer. I don't know if it's some higher ground they're trying to take by not implementing "draft" features, but the fact remains, as an end user of browsers, to me, they appear to be stubbornly behind the curve. At my current job, we are encouraged to share tips and ideas with other developers. I thought it could be useful to demonstrate the problem of dynamic controls and ViewState and my solution (posted three years ago here), since it not only is a problem that could come up in our web development, but it provides a useful opportunity to review the page life cycle. So I grabbed my sample code and opened it in Visual Studio 2010. The good news is, it still works as advertised. However, I wanted to demonstrate the problem along with the solution; so I removed all my "extra" code. I was rather startled to find that the old problem didn't manifest itself. When I typed in data to one control and clicked a button to add another, the first control retained all its data. I did find that things were not all roses. If you add a bunch of controls and start removing controls from the middle of the list, control data would get lost. Also, if you delete controls in the middle of your list and re-add controls, the controls may get added in the middle of the list instead of the end. Create a member variable to hold the list of IDs (or whatever data is required to recreate the control and its ID) — in this example, I'm using private List<string> _childControlIds to just store the IDs, since the control type and location is always the same constant. It no longer appears to be necessary to add the control before setting its ID — the ViewState manager seems to pick it up just fine either way. The custom control in my example has its own delete control and fires an event, that this page subscribes to. Your implementation may vary. And that's it. Surprisingly simple. I don't know at what point this changed (or if I even over-architected the original solution — a distinct possibility). This could be an improvement in .Net 3.5, or it could be something "fixed" in a service pack along the way. The only thing I can say for certain is this much simpler method works quite well in my admittedly simple example. 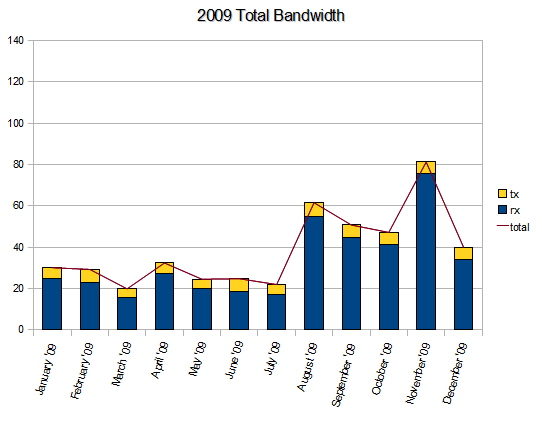 I haven't been posting monthly bandwidth numbers, mostly to distract from the fact that the majority of my posts lately were the monthly bandwidth numbers, and that's just boring. But I haven't stopped keeping track. 2010 proved out what I expected. Since we got rid of paid TV, we have been relying on Netflix for the majority of our video entertainment. The use of this has increased over the year, as we've not only become more comfortable using the service, but the number of offerings of the service has increased as well. Add to this the fact that more videos are available in HD, and it's no wonder that my monthly data usage has only been going up. There are also other items that account for the increase. A large number of file transfers to support our website design business accounts for some of this. Also, we bought a Blu-ray player that has the capability to stream YouTube videos, of which the kids have taken advantage as a substitute for more traditional Saturday morning cartoons. 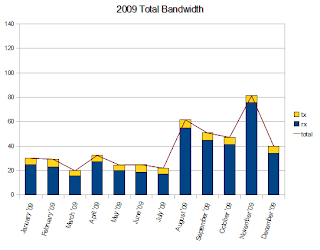 The largest-use month in 2009 was surpassed by 75% of the months in 2010, and the second-highest month of 2009 was exceeded by all of them. 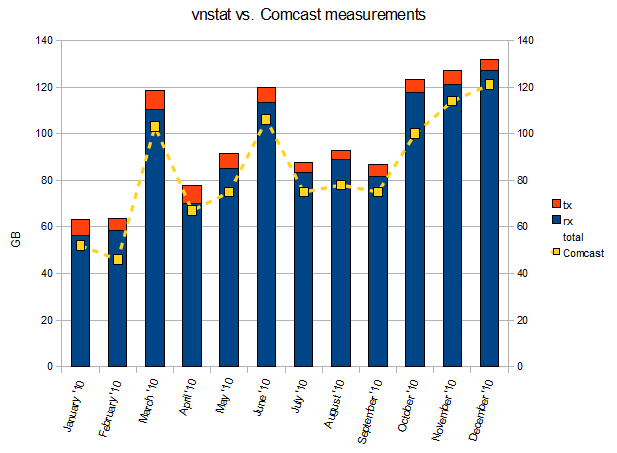 Comcast's measurement was consistently lower than mine, although they were only 8% off in December. It was November when, finally, we reached the halfway point of a monthly cap. The numbers are likely to only go further up. I don't see any change in this trend. Content providers are continuing to innovate and use the bandwidth we have. Netflix's increase in HD offerings is one example. Microsoft recently updated the Xbox to use a higher quality encoding for voice communication, which, although only provides a modest increase in bandwidth, is just another example. All this still leaves me wondering, when will general use and content innovation use up this arbitrary data cap, and turn the number of "excessive" users from what was once claimed to be "a single percent" into the majority? 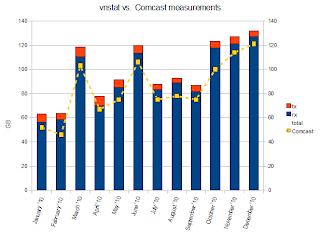 I also wonder if Comcast's policy of punishing those who go over their monthly number will change before or after that happens — or, more cynically, how much revenue they'll collect from fines before they consider changing their policy.